I recently won this great stamp called "Here Comes the Sun" by Market Street Stamps simply by leaving a comment here on the Scrap Review blog. How great is that?! If you aren't subscribed, you should be! They give honest reviews of all the newest products on the market and have frequent giveaways, so check them out! I love that they give pre-CHA reviews too! I don't know why, but when I looked at the stamp I wanted to do something other than yellow sun rays, so I got out my Memento inks and just dabbed colors on the stamp in shades of purple and blue. It almost looks like an explosion of some sort, but I was happy with the way it turned out. I've been playing with this stamp a lot and will have more to share with you soon. This stamp covers the entire card front and then some (which I LOVE) but I trimmed the image down after stamping to mount it on a bashful blue card base. The sentiment is from SNSS Poppies & Greetings. Memento inks used were Danube Blue, Grape Jelly, Lulu Lavender, and Summer Sky. Oh I LOVE what you have done with this stamp. SO beautiful, Carol... and creative. That is amazing! You are so right, it looks like a space happening, with bits of stars and colors flying everywhere. I love it! Cool look!! It really does look like something from maybe like Star Wars! LOVE IT! Very creative too! WOW this is so different and I love it. Great colors together. I can't wait to see what else you can come up with. Thanks for the hint on that site. Off to there now. Enjoy your evening. Congrats on your win! A really neat card...Nicely done! Stunning, Carol! A very unique design!! 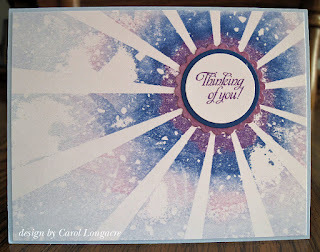 Oh, wow..Carol, I love that you did this sun in purples and blues. What a great stamp to win...lucky you, girl. You are always winning something. It's a fabulous creation.